The beta version of Lightroom was released over 12 years ago and, today, it is a mature and flexible program. Because of its modular structure with hundreds of different tools and thousands of options and settings, it can be adapted for any type of photography workflow. Although the concept of the Develop Presets is only a small part of the Lightroom presets workflow, I consider it to be one of the most important. Originally, Lightroom was created for professional photographers as a Digital Asset Management (DAM) program to complete Photoshop’s editing capabilities. Lightroom was originally named Photoshop Lightroom. The sole purpose of the program was to address the primary challenge of modern digital photography: to manage a high volume of RAW files otherwise known as digital negatives. The editing capabilities of Lightroom were exceptionally limited. Did you know that the first version of Lightroom did not even have a Crop Tool? Over the years, a myriad of new features and editing capabilities have been added to Lightroom, making it more capable and, at the same time, much more complicated. In some areas, it even rivals Photoshop in complexity. Nevertheless, the mass adoption of Lightroom has skyrocketed in recent years. At this point, Lightroom’s user base ranges from professional photographers to beginners and even casual shooters. I attribute such a broad adoption of Lightroom to the explosion of the Lightroom preset market. The Lightroom Develop Preset functionality helped bridge the gap between professional and hobby photographers. It made the professional photography tools more accessible to the general public. What are Lightroom Develop Presets? You probably heard on multiple occasions that Lightroom uses nondestructive RAW editing. But, very few beginners truly understand what this means. If I dig deep into my hard drive where I keep all my RAW files, I will see a bunch of ARW files that are accompanied by XMP files with the same name. The ARW files are Sony RAW images in its proprietary format. The XMP files are Adobe metadata files where additional information about the image is stored. It not only stores EXIF metadata like the date, time, exposure info and so on, it also stores Lightroom editing information. When you edit the RAW file in Lightroom, it stores all the editing steps as simple text entries in the XMP file. 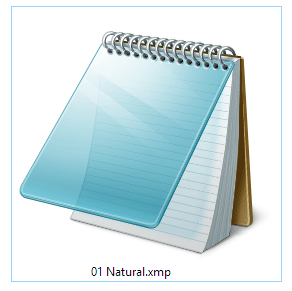 The XMP is also known as a Sidecar file, which is a simple text file that you can open with any text editor like Notepad. When you select an image in Lightroom by clicking on it, Lightroom reads the instructions in the XMP file line by line and creates a JPEG preview with all the edits applied. 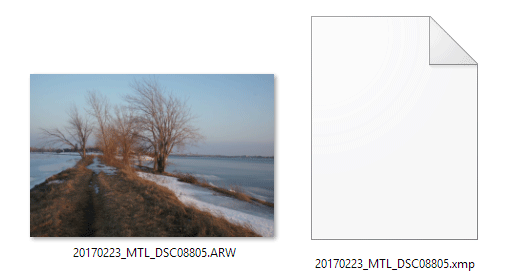 The original RAW file stays untouched and all you see is the JPEG preview. This is called nondestructive editing. The Develop Presets functionality takes full advantage of nondestructive editing in Lightroom. The Lightroom preset is a simple text file with a list of editing instructions. If you open the Natural preset from my Free Collection in the text editor, you will see exactly how I created the preset. When you apply the Lightroom preset to an image, it copies the editing instructions from the preset file to the Sidecar XMP file so that Lightroom can read the instructions and generate an editing preview version with all the editing values listed in the preset. What are Lightroom presets? They are simple recorded instructions for Lightroom. There are several techniques to use Lightroom presets, all of which are intuitive and straightforward. Since Lightroom has a modular structure, there are ways to use presets in various modules. The most common way to use Lightroom presets is in the Develop Module. This is why they are called Lightroom Develop Presets. In the Develop Module on the left panel under the Navigator window, locate the Presets Panel. Open it by clicking the triangular icon. Inside, you will find multiple preset folders (collections). When you open a preset folder, you will see the individual presets inside. To use the Lightroom preset, click the preset name and Lightroom will apply the editing instructions from the preset file to the selected image. Before you start organizing and editing photos, you first need to import them into the Lightroom catalog. This allows Lightroom to track and manage the photos. The Import Module gives us an extensive number of options to apply to the images during the import process. For example, image renaming, preview creation, tagging, and so forth. Another very useful option and one I use regularly is the ability to apply the develop preset to all the photos during import. If I import landscape images, I might apply my most generic and universal preset like the Natural preset to all the imported photos. This makes it easier for me to select the “keepers” during the culling process. Or, another option is to apply the Lens Correction preset to all the photos. I find that using the develop presets in the Library Module is not very useful. Nevertheless, you always have the option to apply the develop presets to a selected photo when you cull and organize your photos in the Library Module. 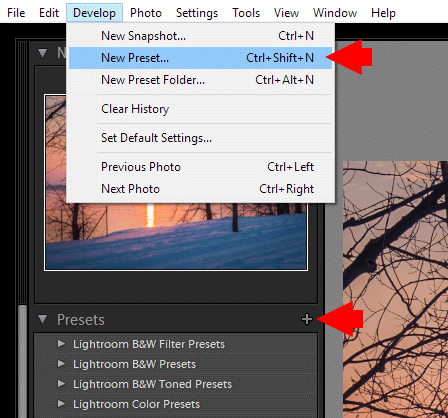 Go to the Quick Develop panel in the Library Module and select the preset name from the Saved Presets drop down menu. Where Does Lightroom Store the Presets? Lightroom has a dedicated folder called Lightroom Settings where it stores the settings and preferences for different tools. 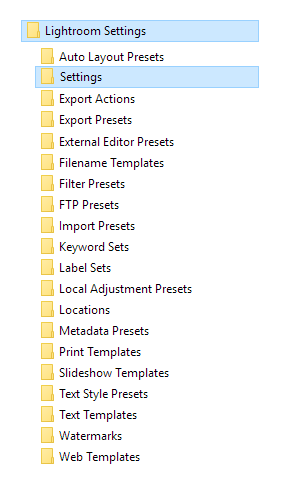 Inside the Lightroom Settings folder, you will find around 20 subfolders where Lightroom keeps all its configuration files and various preset types. One of the subfolders is SETTINGS, which is where you can find all the active Lightroom develop presets. The Develop Presets folder is buried deep inside Lightroom installation and can be very tricky to locate using the file system (Windows Explorer or Mac Finder). 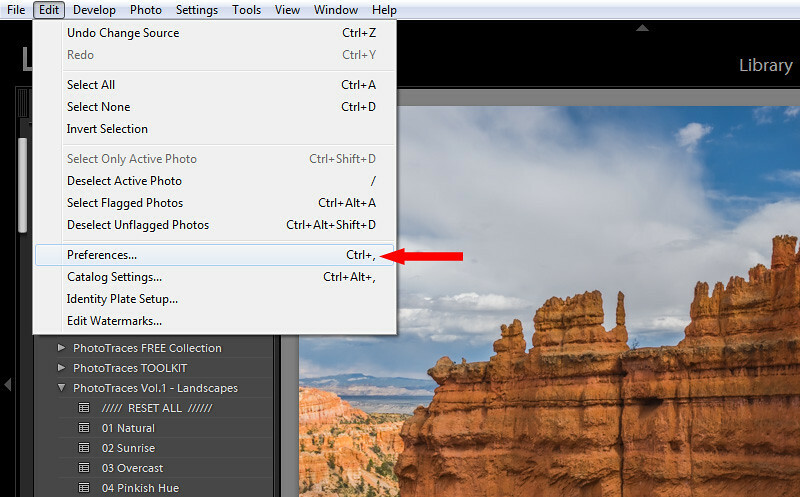 Fortunately, Adobe built a shortcut in Lightroom to help us locate the presets. The process of adding new presets to Lightroom is reasonably simple. 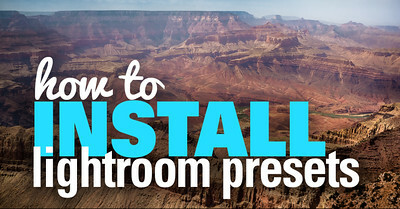 There is no actual installation process; all you have to do is place the preset in the Develop Presets subfolder inside the Lightroom installation. There are two ways of adding a new develop preset to Lightroom. 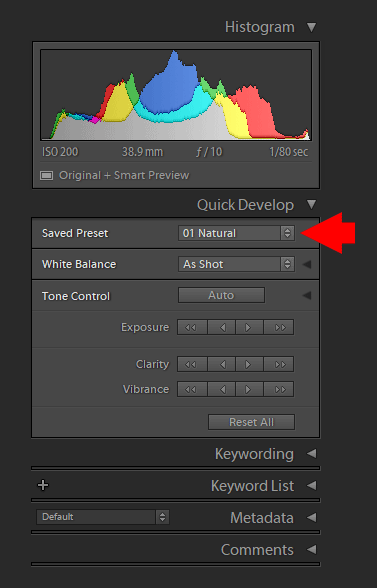 In the Develop Module of Lightroom, locate and open the Presets Panel on the left side. 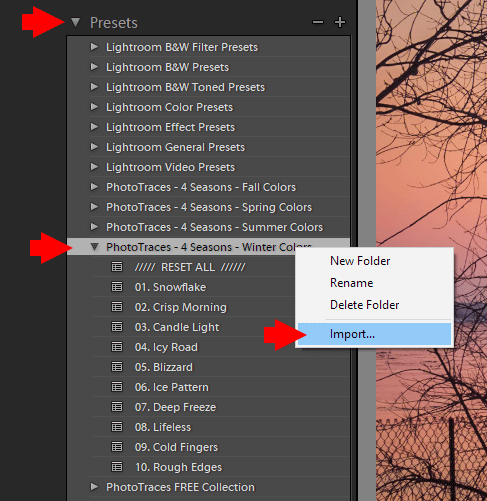 Select the Preset Folder where you want to add the preset(s) and right/option click on it. From the menu, select the Import option and locate the presets intended for import on your computer’s hard drive. 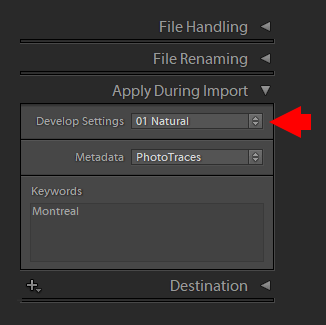 Select a single or multiple presets and click the Import button. You can also create the preset folder first and then import the presets. 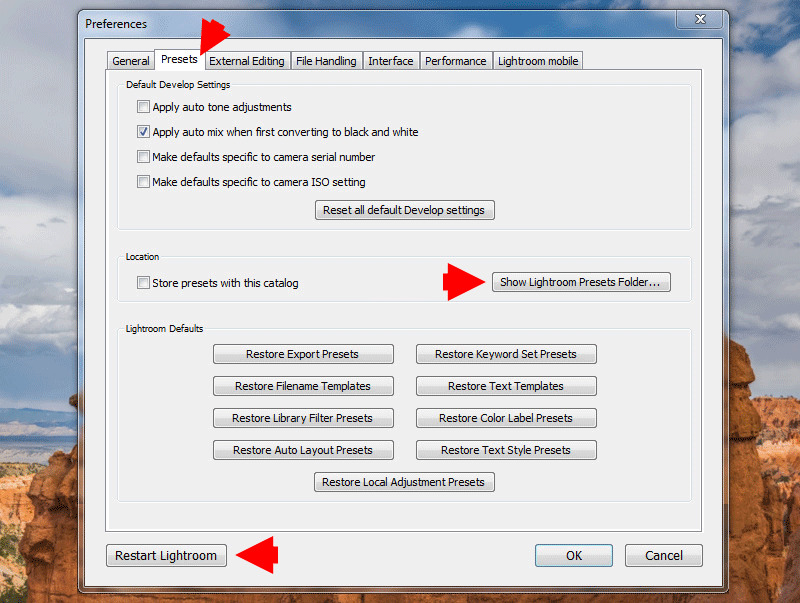 This option is best suited for importing individual presets. When you need to import a collection of presets, the second option works better. 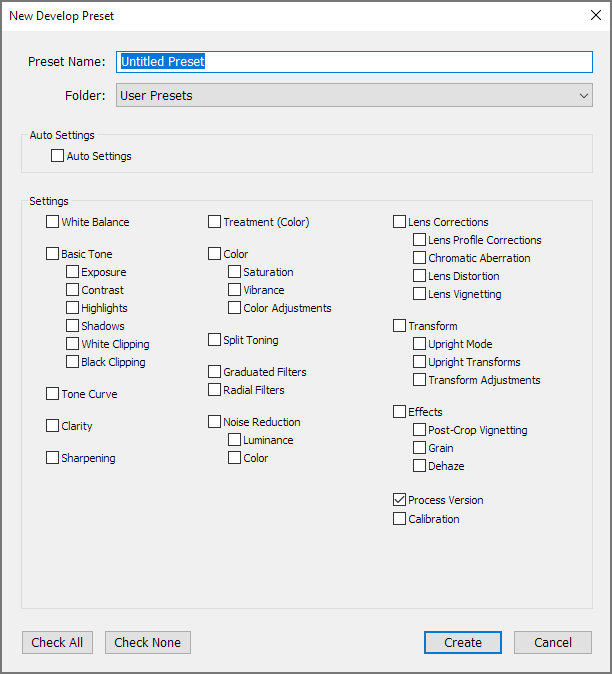 The second option involves placing the preset collection into the Develop Presets folder in Lightroom installation using the shortcut from inside the program. I have a dedicated tutorial on PhotoTraces on how to install the Lightroom Develop Presets in easy steps. The beauty of creating your own presets is that it can easily be done by saving the editing steps from any image in your Lightroom Catalog. The best way to approach preset creation is to follow your regular workflow by editing various images. When you see something interesting and unique or discover an effect you would like to recreate in other photos, save the editing steps of the particular image as a preset. All three options accomplish the same result: they activate the New Develop Preset option menu. Name your preset and select the preset folder as the destination. Or, you have the option to create a new folder in the process. Finally, the most challenging part of preset creation is choosing which editing settings to save and which to avoid. There are no right or wrong options here. It all depends on what you are hoping to achieve. If you select all the settings, the preset will work only with specific images that are similar to the original. Another option is to select only one setting, like Split Toning, for example. In this case, the preset will have a very limited editing effect. Here is an example of the settings I tend to save when creating a preset that I intend to use with a wide variety of images. The biggest misconception about Lightroom presets is that they are only used by beginners and are considered an unfair shortcut or cheating. The truth is, not every beginner uses presets when they edit their photos. But, every professional photographer whose workflow includes Lightroom uses presets daily. If you are a photographer who produces a large number of digital images, Lightroom’s preset functionality not only helps you speed up the editing process, it also makes your photography more consistent in producing predictable results. Here are a few ways Lightroom’s preset functionality can help photographers of different levels and experience. If you are a beginner, the best way to take advantage of Lightroom’s preset is to use it as a tool to learn Lightroom. The most challenging part of learning Lightroom is that the initial learning curve is very steep. It takes far too long to see results you can be proud of and, as a result, often causes beginners to quit in the middle of the process. When using preset-based editing, you can achieve results relatively fast, which keeps you motivated. Later, you can reverse engineer the preset effects to learn how to produce similar results using Lightroom Develop tools. If you are a more experienced photographer, the primary challenge is to develop your personal photography style. Although it takes time to learn the ins and outs of Lightroom, the process of developing your personal photography style takes ten times longer. It is a lengthy and gradual process. I firmly believe that creating your own preset library will help you accelerate and make the process more deliberate. I always encourage my students to use my presets as the foundation for developing their own collections. And, of course, if you are a professional or semi-professional photographer, the preset editing workflow speeds up and streamlines the entire Lightroom editing workflow. It will help you deliver your work faster, allowing you to take on more clients and generate more revenue.